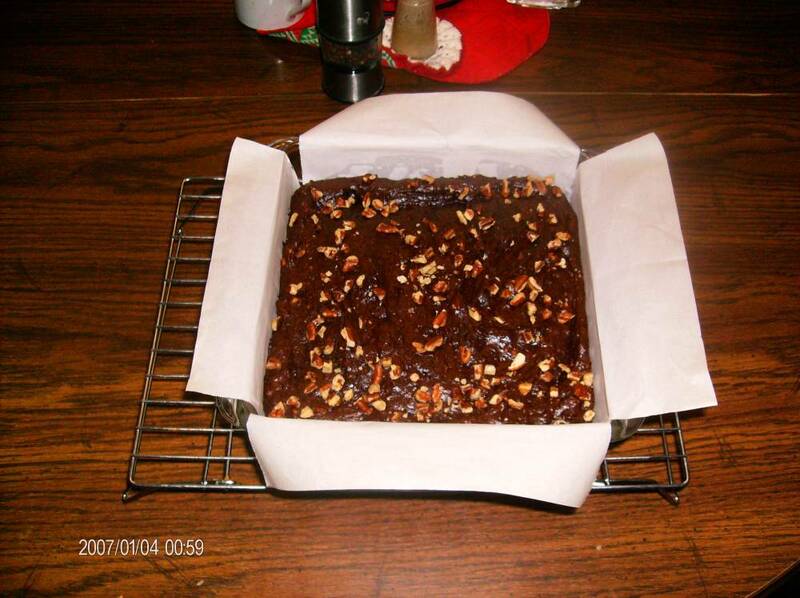 Fudge Brownies: A Great Way to Eat Your Fruits, Veggies and More. This is NOT your traditional Fudge Brownie but uniquely delicious and sinfully healthy! I found this recipe for Chef Richards’s Rehabbed Brownies on the Everyday Health website and couldn’t believe how healthy they sounded which left me skeptical about taste and texture. I made the recipe as it was printed on the website and was taken aback that all me skepticism had been quashed. That got me thinking. Could they be improved upon or be made into variations. My favorite thing is to start with a base recipe and make several variations. Some of the variation I’ve come up with is Chocolaty Mint Brownies by omitting 1 teaspoon of vanilla and the nuts and adding a teaspoon of peppermint extract and adding ¼ cup of crushed candy canes and ¼ cup dark chocolate mini chocolate chops. The key to making these brownies healthier is the reduction of traditional cooking oil and processed sugar. We will use a very ripe avocado (that’s right avocado) and ground flax meal to replace most of the oil and an over ripe banana, light agave nectar and stevia leaf as the source for most of the sweetness. What a great way to get the kids to eat veggies, fruit, nuts, whole grains and omega3 fatty acids. Grease an 8 x 8 inch square cake pan (I use a kitchen natural bristle paint brush for this). Cut (2) 8 inch wide strips of parchment paper. Place one strip of parchment in the greased cake pan leaving the ends overhang (you will use these to lift out the brownies from the pan when they have cooled). Grease the parchment and place the second 8 inch strip of parchment in the cake pan perpendicular to the first. Grease this one also. Make sure the parchment is smoothed securely to the cake pan. 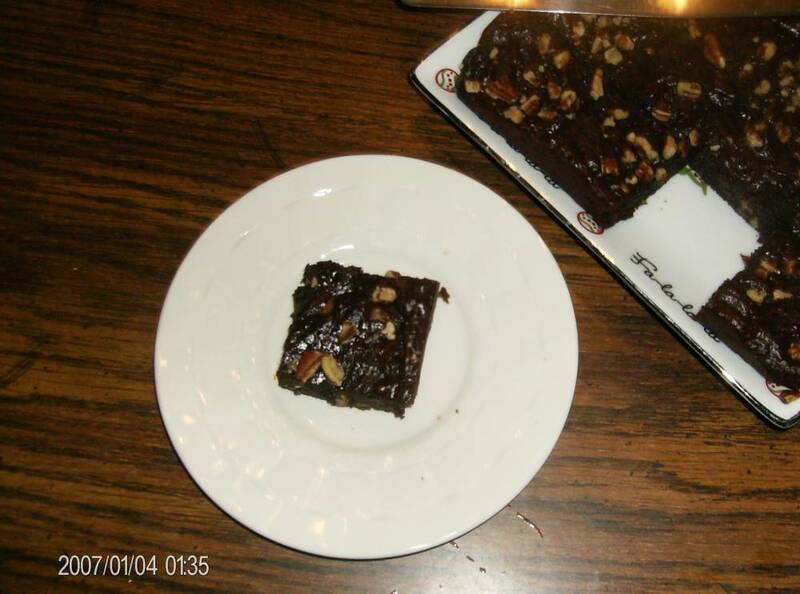 Spread batter evenly in lined cake pan and sprinkle with 2 tablespoons of chopped pecans. Bake for 35 minutes until toothpick inserted into center comes out clean. Cool in cake pan on cooling rack for 30 minutes. After cooling lift out of cake pan by lifting parchment overhangs. Cut into 2 inch squares. Serve. YUM! Note: These brownies have a chocolaty banana flavor which is a is a combination I personally like but if you prefer a more chocolaty flavor I imagine replacing the banana with an additional avocado and ¼ cup additional stevia would probably work just as well. Update: for those who prefer not to have the fruity flavor of the banana mixed with the cocoa use the following combination of ingredients. Bake for 35 – 40 minutes until toothpick inserted into center comes out clean. Cool in cake pan on cooling rack for 30 minutes. After cooling lift out of cake pan by lifting parchment overhangs. Cut into 2 inch squares. Serve. All feedback is welcomed!